On September 11, at 21:54 an emergency call was received to "911" service that a car accident had occurred near the 1st turn of Dilijan: a car had run off the roadway and slipped into a canyon. The rescuers’ help was needed. 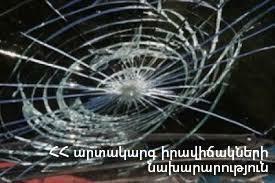 It turned out that a “Toyota Prado” car had run off the roadway and about 40 m slipped into the canyon on the 10th km of Sevan-Ijevan highway: there were no casualties. The rescuers removed the car to the traffic part of the road.